Sign Up to Become a Member Now! Check back regularly for new events! 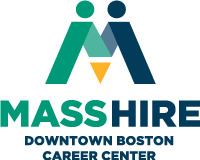 Industry specific job fairs at MassHire Downtown Boston ensure that you’ll meet qualified candidates focused on your industry. And when multiple employers are gathered, we draw a crowd of qualified job seekers (much more so than a recruitment for a single employer)! To find the right job fair for your company, review the calendar on this page. Our job fair space is limited. Register early to secure your table and benefit fully from our marketing efforts. CNA Graduation and Healthcare Job Fair | June 20, 2019 | Link to registration will be posted in late April. Stay tuned! Pharmacy Technician Graduation – July 15 – stay tuned for details. Veterans and their eligible spouses receive priority of service. MassHire Downtown Boston is an EEO Employer. Auxiliary aids or services are available upon request to individuals with disabilities.